You really need to jump on the Intisar Khanani bandwagon. Shortly after I acquired her debut novel, Thorn, for my Kindle, HarperTeen bought the book and it’s as yet unpublished companion novel, A Theft of Sunlight. Intisar Khanani is about to become a thing and her books are about to become more expensive. You can still get Sunbolt and Memories of Ash inexpensively, and you should do that ASAP. In the few books I’ve read by Intisar Khanani, she has impressed me with her complex heroines, nuanced stories and worlds. In Thorn, she gives us Princess Alyrra. Alyrra is the lowest in the pecking order, largely scorned by her court and from a small, insignificant realm. The king of a much more powerful nation comes looking for a bride for his son. Alyrra is afraid to go, but more afraid to stay. On the journey to her new home, there is a magical attack and she switches bodies with her female traveling companion. Alyrra cannot reveal what has happened, and she has a choice now to be free, or to find a way to reveal the imposter and reclaim her body. Alyrra renames herself Thorn. Thorn is based in part on “The Goose Girl” so the basic story will be familiar to anyone who knows the fairytale. Khanani makes some important changes to the story. The maid who steals the princess’ life is a member of the aristocracy, who has abused her position before. Rather than being about someone having a right to rule by blood, Thorn explores what people deserve in their leaders. As a goose girl, Thorn has an opportunity to see society from the bottom. Though the king and prince are kinder than Thorn’s mother and brother, there’s as little justice in her new realm. Thorn can choose freedom or justice. What does it cost to earn love and trust? Is justice enough, or does it also require compassion and mercy? 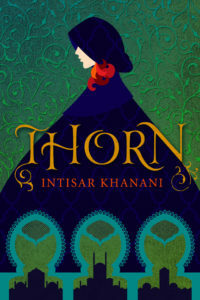 Intisar Khanani is creating some of the most interesting contemporary YA fantasy. I like The Sunbolt Chronicles better, but even in Khanani’s first work, her talent shines. I’ve read everything she has published so far, and her work gets more and more interesting. Share the post "A Price More Than Apple Cakes"
The Kindle editions of Sunbolt and Memories of Ash are still $4. Go get them before they disappear! Done. Also bought Hamilton’s Battalion while I was at it. One click ordering is so dangerous. Wooooo! I’ve just started the last story in HB. The first two were so good I am alternately braced for a let down and consumed with high expectations. I just wanted to say thank you. 😊 I am so thrilled that you enjoyed Thorn so much. And, don’t worry, I am keeping The Sunbolt Chronicles indie in part so that I can also keep them affordable. While pricing may fluctuate a bit, I have no intention of hiking them up a lot. 😉 Thank you, again, for your support! That’s good to know! I am looking forward to your next book, and hope that HarperTeen is giving you lots of support.